Just watched it, typical NOVA stuff. Not a mention of the laminar flow process, no attempt at numerical simulations for rock erosion by water or glaciers, with good reason. Yes, it is difficult to imagine the magnitude of electrical/plasma events that would have been required to produce those landscapes, but easier for me to believe than the flood. And it is all based on the assumptions that those great glaciers existed and made scratches,grooves or furrows in the bedrock, but all those indicators could well have been produced electrically. Ice with a water lubricant between itself and the bedrock does not wear away bedrock. The antarctic was probably the most heavily electrically altered/eroded place on the planet, at scales that boggle the human mind. In lieu of the Bretz Floods, how would you explain the Willamette Iron Meteorite? The Willamette Meteorite, officially named Willamette, is an iron-nickel meteorite discovered in the U.S. state of Oregon by Ellis Hughes. It is the largest meteorite found in North America and the sixth largest in the world. There was no impact crater at the discovery site; researchers believe the meteorite landed in what is now Canada or Montana, and was transported as a glacial erratic to the Willamette Valley during the Missoula Floods at the end of the last Ice Age (~13,000 years ago). It was long held sacred by indigenous peoples of the Willamette Valley, including the federally recognized Confederated Tribes of the Grand Ronde Community of Oregon (CTGRC). The indigenous peoples referred to this stone with the name Tomonowos (the visitor from the sky). The concentration of carbon dioxide (CO2) in the atmosphere determines whether the Earth is in greenhouse or ice age state. Before humans began to have an impact on the amount of CO2 in the air, it depended solely on the interplay of geological and biological processes, the global carbon cycle. A recent study, headed by the GFZ German Research Centre for Geosciences in Potsdam, shows that the break-up of continents – also known as rifting – contributed significantly to higher CO2 concentrations in the atmosphere. The acronym GLOF is used for glacier floods caused by the drainage of naturally dammed lakes in the glacier, on or at the margin of glaciers. Glacial lakes form when a glacier retreats, leaving the debris mass at the end of the glacier – the end moraine – exposed. In the case of the Bretz Flood events which sculpted the coulees in Washington and the Columbia River Gorge and deposited the Willamette Iron and several 'erratics' near it nearly 600' above current sea level, there are several other erratic deposits of boulders not of local geological origin, in fact of Canadian origin, found in the surrounding Willamette Valley area. Many of these erratics are larger and weigh more than the 15.5 ton Willamette Iron and are found several hundred feet above current sea level resting on the current land surface as if they were deposited by a helicopter yesterday. Other than transport in an ice floe, what explains this? Particularly in the case of the Bretz Floods the geological evidence is incontrovertible, water simply does what it does. Anyone who has ever run a sluice box or done flood irrigation understands these things empirically. How can gigantic lightning bolts do this? I don't see why you are trying to compare boulders in Australia which weathered in place out of the native rock outcrop with boulders in the Willamette Valley found several hundred miles from their point of origin in Canada. The Willamette Iron meteorite and several nearby boulders were transported several hundred, perhaps a thousand miles on ice floes in the Bretz floods. The Willamette Iron Meteorite weighs 15 tons and some nearby erratics from rock outcrops in Canada weigh 20-30 tons, one is 40 tons. If there is a logical explanation for an electrical event causing this, please describe it. Otherwise, the geological evidence of the floods is incontrovertible. "..boulders were transported several hundred, perhaps a thousand miles on ice floes"
I have been looking for photos of rock being transported atop or falling out of glaciers but have so far found none. Surely this process should still be occurring today, or are the present glaciers not big enough? And you are right, glaciers are mucho mas pequeño these days; plus some really earth-shaking events are probably needed to load up glaciers with fallen boulders. btw, the "striations" you were questioning earlier are predominately seen on glacier sidewalls. not the H2O-lubed bottoms; though we do know that landforms can tip up and down over time. Did you try a google search for "rock in iceberg"? 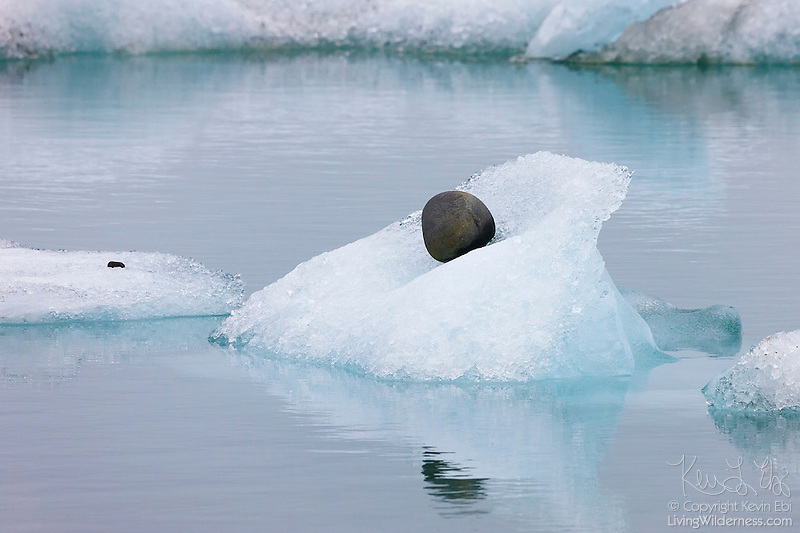 An iceberg carries a rock though Jökulsárlón, Iceland's glacial lagoon. Glaciers have been known to carry rocks great distances. Rocks fall onto glaciers, which move slowly down mountains. When the glacier melts so much that it can no longer support the rock, the rock is dropped and it becomes known as a glacial erratic. The term referrs to rocks that are different in size, shape or composition from other rocks around them. Ha those pics are adorable! I guess I'll have to admit to the power of flowing water after all. 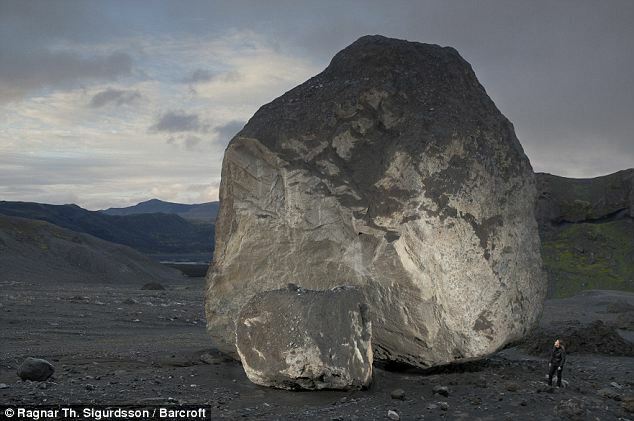 The giant stone was released by ice in a glacier that melted thanks to the fantastic heat produced by the erupting volcano. The melting glacier caused a meltwater flood, which swept the rock down the mountainside with it.